Embrace Relief is a 501 (c)(3) non-profit organization which collaborates with volunteers to deliver humanitarian aid and disaster relief to vulnerable communities around the world. 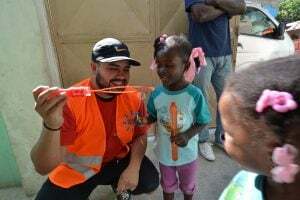 In accordance with United Nations Sustainable Development Goals, our teams offer relief in the form of financial, emotional and physical support, in order to meet the needs of people ravaged by disaster and other misfortune. The foundation collects and distributes supplies to families, individuals and institutions. Delivering research-based, sustainable solutions to achieve lasting improvements for individuals and communities. Driven by a strong belief in the power of comprehensive development, Embrace Relief is committed to creating a lasting impact in the lives of individuals locally and globally. We implement research-based programs to achieve measureable, sustainable improvements in the lives of those in need. By constantly using research and closely engaging with those we serve, our innovative approach ensures we deliver the most beneficial services. Over $1.4M was spent for disaster relief efforts in both domestically and globally. Over 270 water wells built in several countries, providing clean drinking water to approximately 270,000 people. Over $1.5M was spent on refugee relief. Over 2,100 cataract surgeries were conducted and more than 21,000 health checkups were completed. $259,000 was spent on yearly living expenses for children.